The Google Dance Is Coming To Osaka & Singapore | The SEO Dr. The Google Dance at the GooglePlex, at Google’s California headquarters, did not happen in 2018 but they did bring it back to the US the two previous years but did not do so this year. But the Google Dance was brought to Tokyo this year, as well as previous years and it is now scheduled to happen in both Osaka, Japan and in Singapore. The Google Dance Singapore is happening on July 26, 2018 between 13:00 – 20:00 at Google Asia Pacific, 70 Pasir Panjang Road, #03-71, Singapore, 117371. You are asked to register over here before the 6th of July. Google will be providing dinner, snacks and drinks for those who attend but the space is limited, so register asap. Googlers Gary Illyes, Webmaster Trend Analyst, Yinnon Haviv, Software Engineer – Search Console, Juan Felipe Rincon, Lead – Global Search Outreach and Stacie Chan, Strategic Partner Development Manager will be speaking that night. Takeaki Kanaya from Google will also be at this event. To learn more and register, go over here. 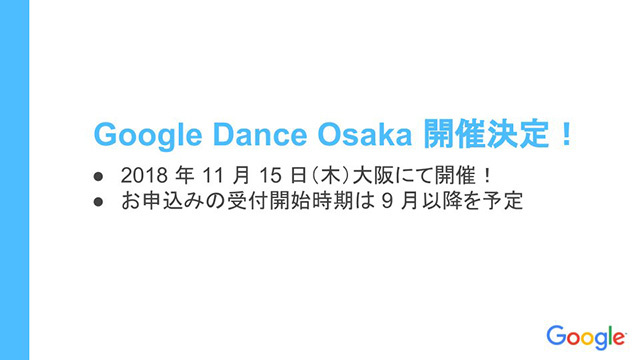 The Google Dance in Osaka, Japan, will be held on November 15, 2018. Registration has not yet begun but Google is asking those interested to hold the date. Googlers Anna Ogawa, Gary Illyes, Takeaki Kanaya and others will be there. Again, save the date, more information to come about this event. Forum discussion at Twitter and Twitter.